2 Bedroom Detached Bungalow For Sale in Torquay Road for Offers in excess of £350,000. If you are looking for a holiday home that offers modern living with top of the range appliances and furnishings then the 'Seascape Lissett' is a must to view. 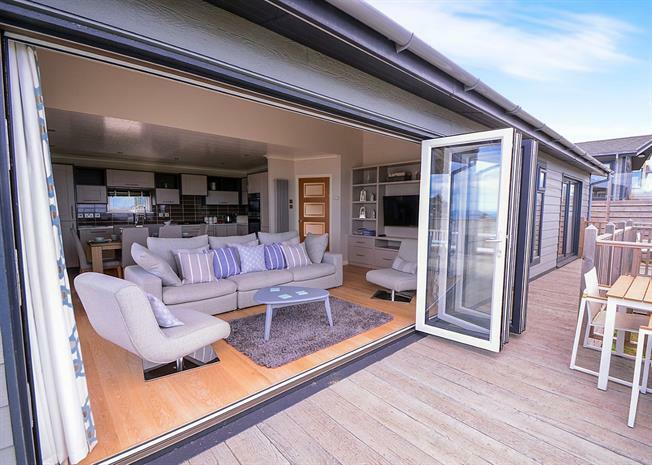 This spacious holiday home offers an open plan modern kitchen/dining area which flows into the lounge area and has access to the decked area via concertina doors. Their is a concealed utility area in the entrance hallway, modern kitchen which has been fitted with top of the range 'Bosch' appliances, the master bedroom, with en suite shower room, is accessed via sliding patio doors onto the decked area. Housing 'Bosch' washer/drier, hot water tank and gas central heating boiler and temperature controller. Coved to white clad vaulted wood ceiling with inset led roof lighting and is controlled by a dimmer switch, two inset ceiling speakers, double glazed window to front, three column wall mounted vertical steel radiators, two double glazed windows to side fitted with modern roller blinds, range of modern cream wall and base units with marble effect work tops over, integrated 'Range master' stainless steel square one and a half bowl sink and drainer with chrome spiral spring mixer tap, tiled surround, integrated 'Bosch' four ring halogen hob with concealed extractor hood and light above, integrated multi functional eye level 'Bosch' double oven, grill, and microwave functions all with touch controls, integrated concealed 'Bosch' fridge/freezer, super silence 'Bosch' dishwasher and an electric wine cooler fitted between the base units, interlocking wood effect flooring. Fitted modern TV unit with drawers and shelving space to both sides, double glazed sliding door leading to side decked area with glass balustrade, at the rear double glazed concertina doors lead out to the decked seating area perfect for fine dining and enjoying the stunning direct views of the jurassic coast and beyond. White wood clad ceiling with inset led lighting controlled by a dimmer switch, obscure double glazed window to rear, airflow icon extractor fan, modern shower cubicle fitted with dual shower head and sliding glass screen, modern wooden fitted vanity unit with two inset oval ceramic sinks both fitted with mixer taps, storage cupboards below, mirrored bathroom cabinets above with lighting and shaver points, fully tiled surround, column wall mounted vertical steel radiator, low level WC, interlock white wood flooring. White wood clad ceiling fitted with inset led lighting controlled by a dimmer switch, double glazed window to front, radiator, TV point. White clad wood ceiling with inset led lighting, airflow icon extractor fan, obscure double glazed window to front, fitted modern wood vanity unit with inset oval ceramic wash basin and mixer tap, drawers to side and storage cupboard below, large fixed mirror with led lighting above, low level flush WC, white modern 'P' shaped panelled bath with fitted electric shower over, glass curved shower screen, fully tiled surround, column wall mounted vertical steel radiator, interlock white wood flooring. Brick paved driveway parking for 2 cars, laid to lawn area at front, side garden with mature shrubs and flowers enclosed by stone half wall border.